Consumers pay more attention to their diets and a healthy lifestyle these days, but they certainly have not lost their sweet tooth and for this reason frozen yoghurt is a popular alternative to ice cream. 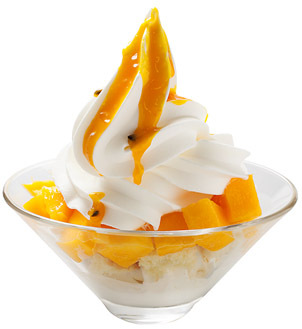 Frozen Yoghurt is the hybrid between traditional ice cream dessert and yoghurt based products. There are a number of reasons as to why frozen yoghurt is the alternative to ice cream, with one of the main reasons is the emphasis on health that comes with frozen yoghurt. It is an innovative way for customers to have their cake and eat it too. While frozen yoghurt can taste tartier than ice cream, the fat content is generally lower because of the use of pure milk instead of heavy cream that’s used in ice cream. The emphasis on a treat that is both tasty and a little bit healthier is why frozen yoghurt has made a colossal comeback in the last decade. With a new generation of flavours, toppings and store settings, frozen yoghurt has led the change in the frozen dessert market. This new wave of frozen yoghurt franchises are nowhere near freezing point and have done nothing but grown in popularity. As recently as the 90s, frozen yoghurt has made up 10% of the whole dessert market according to Franchise help. So what makes it the popular dessert option it is today? Because Frozen Yoghurt uses milk as opposed to cream it is better for your body and is seen as a low-fat or even fat-free alternative. While frozen yoghurt is not as healthy as normal yoghurt, the benefits are still there, as some frozen yoghurt contains more minerals and nutrients than regular ice cream. Frozen yoghurt may also be high in calcium and protein making it good for your bones and low in calories. On average, one serving of frozen yoghurt has as many calories as a piece of chocolate cake – if you stick yo healthy toppings such as fresh fruit and nuts it makes it hard to beat as a guilt free dessert. Frozen Yoghurt stores today are rewarding due to the fact they target two key factors when it comes to modern customers – they offer the healthier alternative to today’s health conscious market and a next level of customisation and customisation that is simply unavailable in other desserts. Whether you enjoy it in a cup, cone or even a smoothie, frozen yoghurt is all about options. Frozen Yoghurt has a mass appeal because of the customisation it offers customers from the toppings to the flavours and the way you enjoy it. Like ice cream, frozen yoghurt has a wide flavour selection to choose from, so customers can enjoy a different dessert experience every time they visit their local frozen yoghurt shop. The flavour combinations expand even further when the diverse selection of toppings are considered, from salted nuts and sweet candies to fresh fruit and brownie bits. This freedom of being able to create the exact dessert and flavourings is what continues to bring customers back to frozen yoghurt stores. In an economy where so many people are limited to what they can eat and watching their diet, self-serve frozen yoghurt have given the power back to customers in their serving size, flavours and additional toppings. The option of self-serve provides more options on what customers can add to their dessert especially when it comes to mixing flavours such as chocolate and passionfruit or lemon me and lime mixed with salted Caramel. There is almost no way a customer can walk away being dissatisfied with their dessert. Traditionally trends in the dessert market tend to be momentary lapses of popularity, however since healthy frozen yoghurt sensation re-emerged in the late 90s, it has yet to lose momentum or its popularity. It’s one trend that defies trend standards and as the health conscious market continues to grow so does the demand for frozen yoghurt – the healthy alternative.